The BugLady has been standing in the water and hanging off of piers trying to photograph this sparkly (and speedy) little spider. 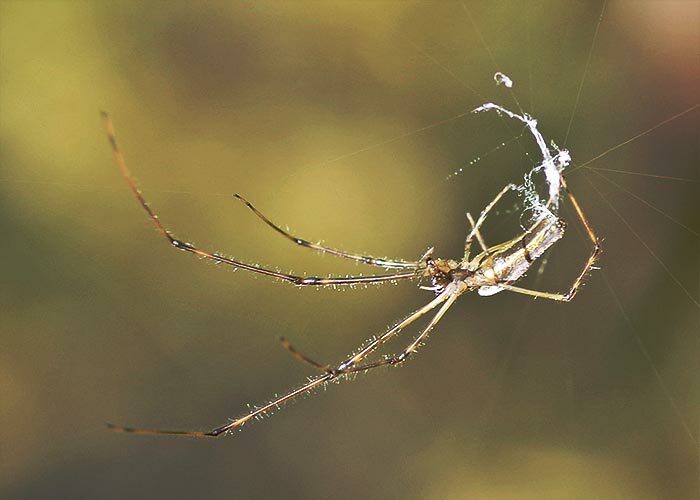 It’s one of the Long-jawed orbweavers in the genus Tetragnatha. 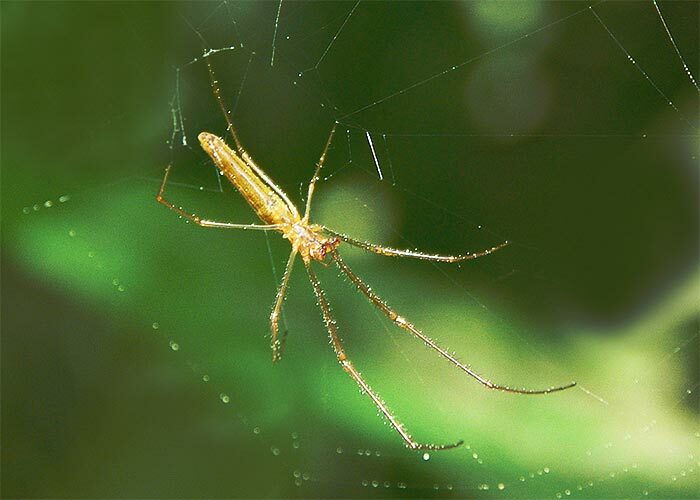 It’s not in the same family as the garden spiders and orbweavers of previous BOTW fame (Araneidae) but is in the Long-jawed Orbweaver family Tetragnathidae. Its tongue-twister of a genus and family name comes from the Greek tetra and gnathos meaning four jaws. One look at this picture from bugguide.net will explain its common name. What are those things? A brief tour of the front end of a LjO is in order. The technical term is chelicerae, and they are the spider’s jaws. In this bunch of spiders both genders have long jaws, though his are longer, and they are absent in young spiders. A spider subdues its prey by holding it with its legs and the leg-like palps/pedipalps (the orb-tipped structures in the picture). It injects poison/digestive juices through fangs located at the tips of the chelicerae (the fangs are folded back against the end of the chelicerae). The male’s pedipalps eventually function in reproduction. Spiders can tailor the amount of venom they deliver to fit the occasion. Tetragnathidae is a large family (about 1,000 species) whose members are found all over the world (they especially like the tropics and sub-tropics). 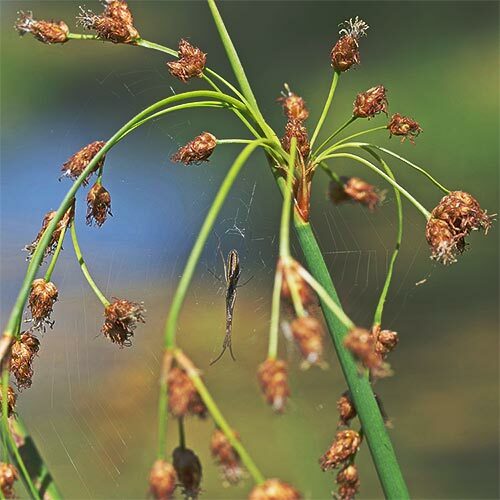 There are about 15 species of LjOs in the genus Tetregnatha in North America (they’re also called “stretch spiders” and “stilt spiders”) and they’re typically found in vegetation near or over water. They are well-camouflaged—their abdomens tend to be long and slim; they hold their rear pair of legs out to the back of their body and their two front pairs of legs to the front when they are at rest. The shorter third pair of legs is held out to the side. Their eight eyes are arranged in two rows like this (::::). Figuring out which species of Tetragnatha is/are pictured in this BOTW would require a spider expert and his/her hand lens. LjOs (not surprisingly) spin orb webs, but their webs are more loosely woven than those of their Araneid cousins, with fewer spokes and an open center. The webs are short-lived and may be rebuilt daily, and are tilted, sometimes at an almost-horizontal plane. Why? Because their webs are often situated over the water’s surface. There, insects that are aquatic as immatures (like mayflies, midges, gnats, and caddisflies) emerge from the water as adults and fly directly up into the LjO’s net. LjOs may wait in the center of the web or off to the side; camouflaged by their characteristic posture. If disturbed, they rush into the vegetation and wrap their legs around a stalk, or they drop to the ground. They can locomote rather effectively on the water’s surface. 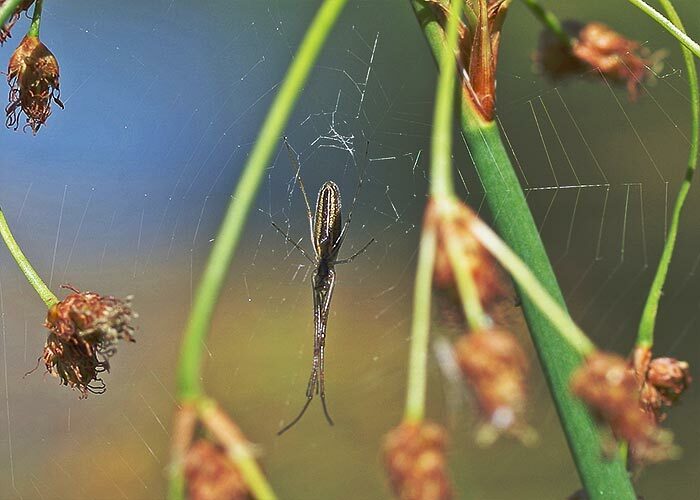 In an attempt to discover the environmental factors that LjOs use to decide web location, Rosemary Gillespie studied the Elongate stilt spider Tetragnatha elongata, an LjO that occupies the eastern half of North America. She discovered that not only did the water provide the spider with its supper, it provided vital humidity that kept the spider from desiccating. Temperature is a more important dehydrating factor than the humidity in the spider’s microhabitat, and a spider can put up with a certain amount of dehydration if prey is plentiful. Her conclusion—“The primary determinant of web-building appears to be access to open water.” The availability of prey and of suitable twigs to anchor the web were also important. Most spiders dislike the company of their peers, but some species of LjOs will tolerate it, even building neighboring webs. Even building gigantic, neighboring webs. This Tetragnatha guatemalensis web that was discovered in Texas’s Lake Tawakoni State Park in 2007 was an instant hit on the World-wide Web and will probably be the subject of a horror movie someday. Spiders from about a dozen different families were discovered within the gigantic web. Inquilines? (the BugLady does love that word). Courtship occurs in late summer and is brief. Males and females lock jaws (thus “lip-locked,” she cannot eat her mate) and he uses his pedipalps to deliver his bodily fluids to her. An egg sac is subsequently attached to nearby vegetation and although the female may guard the eggs for a while, the adults will die in fall (most spiders live less than a year). The spiderlings emerge from the sac in spring. Weber, in Spiders of the North Woods, says that this spider is often “collected” during the harvesting of wild rice. When rice stalks are bent over a canoe’s gunwales and beaten to loosen the kernels, the spiders are loosened, too. And, in the “Still-Making-It-Up-As-We-Go-Along” category, one species of Hawaiian LjO has abandoned webs and hunts on foot, dining on more non-flying invertebrates than its web-spinning sisters.